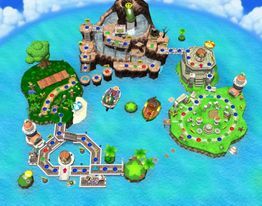 Castaway Bay is a tropical board in Mario Party 6. This game board is made up of three main islands and a port where the players start at. 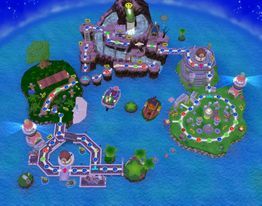 The objective for this board is based off of Mario's Rainbow Castle from the original Mario Party, for it is a one-way path (with junctions) to the Star Space, where the players would get on a boat that belonged to Donkey Kong or Bowser. Players that make it to DK's Boat make Donkey Kong appear to give the player a Star for 20 coins. He then gives them a safe ride back to the start. However, players that stop at Bowser's Battle Yacht will meet up with Bowser, who gives them a Shadow Star that takes away a star or 20 coins if they do not have a star. On the northern island there is a river flowing downstream. Players passing by are stopped by a Shy Guy who asks if they want to go rafting for ten coins. Accepting takes players downward near the Star Space. However, if DK's boat is docked at the Star Space, Bowser fires cannonballs at rafting players. If hit, they will lose five coins, and their turn ends. Landing on the ? Space at any of the ports with the Star Space on it makes players hit it, making a bell sound that switches Bowser's and DK's boats around. Landing on the ? Space in front of the tree on the first island makes Ukiki appear to ask if the player wants to play a game. Accepting will make players try to catch coins Ukiki throws and avoid the Spiny Eggs. Hitting a Spiny Egg will stun the players for a little while. The ? Space at the third island near the Star Space has two functions depending on the time of day. If it is daytime, players have the choice to pay their respects to the Great Mushroom Spirit to get an Orb or coins. At night, the Mushroom statue is replaced by a Goomba, and players have the choice to pay respects to the Great Goomba Spirit. It does not matter if they do or not, for the outcome is always Paragoombas taking players to exchange positions on the board. This is only board other than Towering Treetop to feature Pink Boo, who will give her services to someone who comes by as long as it's nighttime. Also, at night, an alien in a UFO can be seen on the eastern island, though this has no effect on gameplay. During the day, the UFO can be seen wrecked in the water near the southeast corner of the island. This is the only board in Mario Party 6 where Bowser can be seen during the day. Conversely, it is also the only board where Donkey Kong can be seen at night. A slower-paced rendition of this board's music is used for Mario Party 7's main menu. This page was last edited on April 19, 2019, at 21:29.